Twitch Signs $90M Deal With Overwatch League | Nerd Much? This is a "landmark deal." According to the Sports Business Journal, Twitch has recently signed a deal with Blizzard for exclusive streaming rights to Overwatch League, starting today. For the next two years, Twitch will be the only one to stream half of the weekly matches. 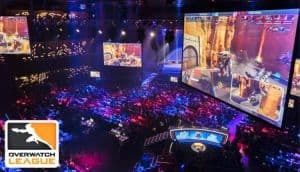 The other half will be simultaneously streamed on Blizzard’s own streaming service, Major League Gaming. Unlike the latter, however, Twitch will be streaming in English, French, and Korean. The Twitch streams will reach all parts of the globe, save for China, likely due to the restrictive laws of the country. Major League Gaming president Pete Vlastelica has stated that this is a “landmark deal” and “establishes a value around our rights and maybe professional esports content rights in general that’s unprecedented.” He’s certainly not wrong, as it was revealed that Twitch paid out $90 million for the exclusive rights. In addition to streaming rights, Twitch will also be providing the programming for Overwatch League, and a reward program for those that regularly watch the streams. Likely something to do with the Twitch’s premium service. It is unknown what else the deal includes, as the price tag implies that there should be more to it. For comparisons sake, the only other deal that comes remotely close to the value of this one, is the one between Riot Games and BAMTech. The deal was valued at $300 million for “exclusive on joint tech-development and commercialization” to last seven years. Much longer than a measly two years. So either Overwatch League came with a hefty price tag for Twitch, or both parties plan on making a lot more money with the event as it continues. An idea that will not be wrong, the mere popularity of Overwatch as a game on its own should be enough to prove that the eSports version is going to bring an even larger crowd.